Moscow condemns the international coalition air strikes in Libya, and so does the Arab League and the African Union. Russian Foreign Minister Sergey Lavrov is in North Africa to discuss the ongoing conflict. At least 60 people have already been killed as a result of the coalition air strikes, and as the strikes continue, that number is expected to rise. Vladimir Putin insisted nobody has the right to intervene in political conflicts in sovereign countries, calling the Security Council resolution a flawed document. "The UN security council resolution is undoubtedly incomplete and flawed. If you look at what it says, it becomes apparent that it allows everyone to undertake any actions against a sovereign state," Putin said. ”We're concerned at the ease with which decisions are being made over the use of force in international affairs today. In US policy it's becoming a dangerous tendency. During Bill Clinton's time they bombed Yugoslavia and Belgrade, Bush deployed troops in Afghanistan, then under false pretenses more forces were deployed in Iraq, destroying the entire government of Iraq. Now Libya is next – they say they're protecting civilians. But it's civilians who are dying when they bomb Libya. Where's the logic and the conscience? There's neither,” added the Russian prime minister during his visit to Central Russia. Meanwhile, the UN Security Council is set to hold closed-door consultations on the situation in Libya later on Monday, diplomats said. The discussion was called by China – this month's council president – in response to a letter from Libya and a Russian request. Russia and many of its allies around the world find it unacceptable, saying that the UN Resolution 1973 spoke only of establishing a no-fly zone that was supposed to guarantee civilian security. “It is unacceptable to use the mandate subsequent upon UN Resolution 1973, the adoption of which was quite an ambiguous move, to achieve the goals which clearly are beyond its scope as the resolution stipulates only measures to protect civilian population,” the Russian Foreign Ministry said. Sergey Lavrov is planning to visit Algeria while in North Africa. He is currently in Egypt, where he is expected to meet a number of officials to discuss the situation in Libya. 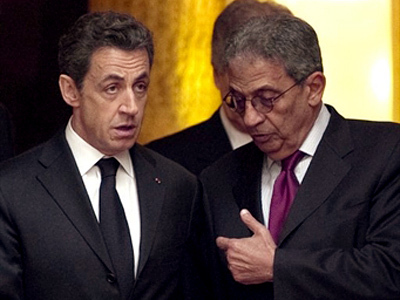 He will also meet with the Secretary General of the Arab League Amr Moussa. 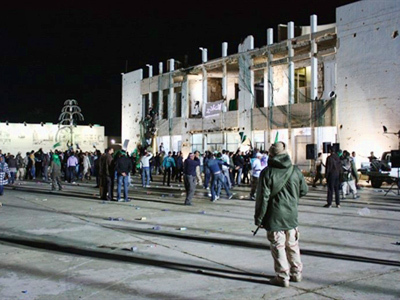 The Arab League initially supported the establishment of the no-fly zone over Libya but have since changed their position, seeing the number of civilian casualties. "What is happening in Libya differs from the aim of imposing a no-fly zone, and what we want is the protection of civilians and not the bombardment of more civilians," Moussa said. Many believe that the current intervention will not only destabilize Libya and aggravate the conflict even further, but this destabilization may even spread to the entire North African region. The African Union's panel on Libya has called for an "immediate stop" to all attacks on Libya and said that "political reforms to eliminate the causes of the present crisis" must be carried out there. The panel consists of leaders of South Africa, Uganda, Mauritania, Congo and Mali who are expected to travel to Libya shortly to help end the violence. 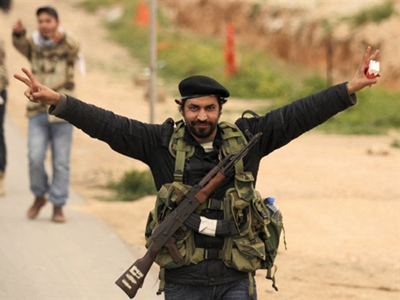 India has come out and said that it strongly disapproves of the air strikes in Libya. The minister of external affairs said that they are hoping for a peaceful settlement with the help of the United Nations and other regional organizations. He said that he believes that air strikes would be counterproductive and harm innocent civilians, foreigners and diplomats. “India views with grave concern the continuing violence, strife and deteriorating humanitarian situation in Libya. It regrets the air strikes that are taking place,” a ministry statement said. India said it will do whatever it can to strongly discourage violence in Libya while respecting the wishes of the Libyan people. Watch RT's Priya Sridhar's reporting from New Delhi. Turkey, a very important Arab ally within the European Union and NATO community, is also getting increasingly concerned about what is happening. 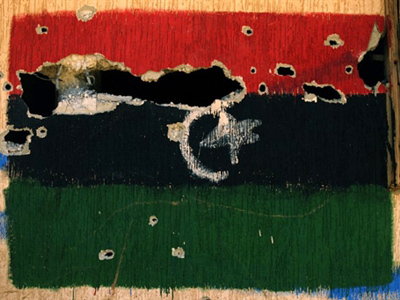 EU foreign ministers are meeting in Brussels on Monday to discuss the events in Libya. As for NATO, it is day three of the alliance's “two-day” meeting and ambassadors have so far failed to agree on whether to get involved. Meanwhile, British Defence Secretary Liam Fox’s comment that Muammar Gaddafi is “a legitimate target” received a mixed reaction. 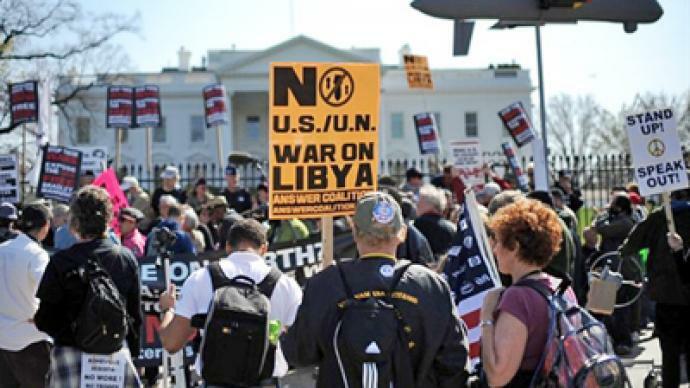 Protests against the coalition air strikes in Libya took place in some US cities, including New York, Chicago and San Francisco. An anti-war demonstration has also been held in Brussels and more are expected, including in London. Watch RT correspondent Daniel Bushell's report from Brussels. ­Meanwhile John Laughland from the Institute of Democracy and Cooperation in Paris says the coalition forces are greatly mistaken – this escapade will end in catastrophic failure and will inflame the situation even more than it is. It will last far longer than they gambled for, as it shows, the interventions never end “ These people – the British prime minister, the French president, the American administration are so happy to let bombs fly on countries almost at the drop of a hat – they are so determined to get the outcome they want – which is to overthrow Colonel Gaddafi – it will make the discord in voices that are already coming within the Western states and in the Arab league – this will make it very difficult to continue the war. But I’m afraid, they won’t let go now that they’ve started “says Laughland. ­Anti-war and social justice activist Sara Flounders argues that this is a colonial war for Libya’s oil reserves, the biggest on the African continent. The goal, she says, is total control of Libya’s oil, and is not meant to help the Libyan people – on the contrary, it will be devastating for the people in Libya, who are paying a horrendous price.